I didn't understand the scale of this problem until I started to monitor the behaviour of the bearings on Cleddau bridge some years ago. I noticed that, as well as moving backwards and forwards as they were intended to do, one bearing went ahead of the other at different times of day and the difference was large. about 0.5mm in the width of a 440mm wide roller. Rollers are really not capable of taking that so we may reasonably assume that the engineers concerned hadn't thought of it. The Cleddau was started about the time FRB was opened and was designed by the same people, so we might reasonably suppose that they didn't think plan rotation was an issue there either. However, Suspension bridges are flexible in plan, as well as in elevation. The flexibility in elevation was amply demonstrated by the load test. When the bridge was just finished there was a very big gale and the engineer reckoned the bridge bent sideways so that at mid span, the central reserve was roughly in line with the tower legs, a side sway of 6m. (I worked n big bridges in my boyhood and knew some of the people who were then my bosses). Let's just put that on hold for a moment and consider a much smaller sway of say 2.5m. The bridge will bend into something resembling a sine wave in which the end rotation is roughly twice the deflection in half the span. so say 5m in 500 or 1in100. (You see why I chose 2.5m deflection, this is an engineer at work). In the sketch above I have shown a 3om deflection to indicate the shape clearly and also a 3m deflection with the tangent line extended to show a true shape. The top of the links are fairly stiffly attached to the tower. The bottom is equally stiffly attached to the main truss. The bottom pin is therefore trying to twist its link by 1 in 100 and that will develop a bigger stress than imagined by the designers, concentrating at the point where the link becomes narrowest. It is the scale of these rotations that I believe catches people out. Engineers live by picking things that can be discounted as too small to cause trouble and without some serious thought (and possibly actual measurement of the effect) I certainly would not have considered this to be a problem. Even with modern computers, the stress pattern would be extremely difficult to calculate, and the original design was done in the days of slide rules. So, I would defend, quite robustly, anyone who had failed to spot that as a danger. The stresses would not have to be enormous to create fatigue and if you haven't been warned to look for it, you would very easily miss the initial very small cracks. Only when the crack got to a critical length and went bang would the trouble become evident. And if you happened not to look in the few days before the bang, you would never spot the trouble before failure. Having said all that, there was no really serious danger. The link supports the end of the truss and keeps it aligned. If it had broken completely it might have cause a steep ramp to appear in the expansion joint but the joint is a good metre long (a sort of mini bridge in its own right) so it would be a ramp, not a step. On the other hand, it would have been a bang if the other link went. Repair would have become very much more difficult. Closing the bridge was definitely the right thing to do. And finally: What I am doing here is mapping my own observations on to reported damage. My ideas could only be checked by close examination and measurement. I may be completely wrong. Sorry for the delay in my note on FRB bearing rotation. Hope to get to it tomorrow evening. There seems to be real interest in yesterday's post so here comes some more. A load test was carried out using gritting lorries to apply 518 tonnes to one lane over half the length of the bridge. That's almost exactly 1 tonne per m. That is just a little more than the code required in the 1960s and a half span is the worst possible. The bridge posted these two pictures. 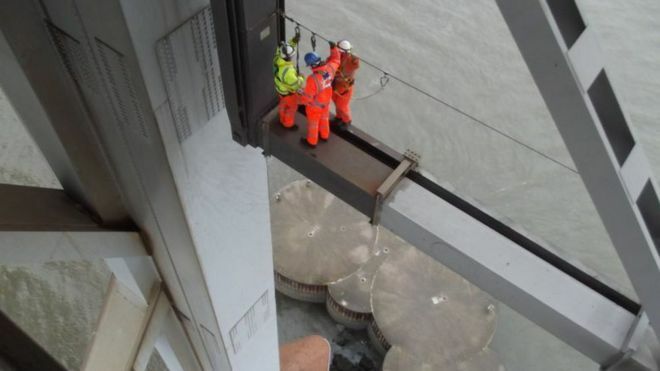 This picture of the load in place was also posted by the Forth Road Bridge (at https://www.forthroadbridge.org/bridge-closure/images/) It's worth watching that, there is a lot to see and pictures accumulating daily. This isn't absolutely correct, but I think it shows how the main span has gone up at the far end as well as down and how the side spans have been lifted. I think that needs explaining too so here is a sketch. The grey lines show the original shape and the black the deflected shape. The extra tension in the cable pulls the towers closer together. That lifts the side span and allows the main span to drop. But the load at one side also causes it to sway that way and results in the deflection which is looks like a full parapet height. Since this is a cycle lane, I guess that must be 1.8m. Most people know me as an arch bridge man but my first love (starting with Clifton) was always the big ones. I worked on Humber for a while and have always maintained the interest. I was wondering what was going on on Forth and guessed it must be a bearing problem from a number of clues (including a friend ordering some of our Moire Tell Tales for urgent application in Edinburgh). Then, as a result of an extended set of links, I got a call from the BBC about talking about this on PM. I was almost immediately stood up in favour of Dave Parker from NCE but my mind was engaged. So here are my thoughts. First a bit about bearings in general and then some Forth Road Bridge (FRB) specifics. Civil engineering is mostly about big lumps carrying relatively low stresses. The big lumps (such as bridge decks) are inclined to want to move so they have to be supported in such a way that they can (or designed to cope with the effects of being prevented from moving, but on a big bridge that is impossible). In longer bridges, the big movement is usually expansion and contraction along the length as a result of temperature changes. The range of movement in a straight steel bridge is a little less than 1mm per metre of length over the life. In suspension bridges it might be twice that because of the way the various parts interact. If we stick with steel bridges, they are typically built to a tolerance of perhaps 3mm locally. Over long lengths 1/500 is typically specified.The fabricators may do better now but that was notoften bettered in the 1960s. Bearings of the older type with pins and rollers are very fine machines, often built to 0.01mm or better. They depend on good fit and alignment if they are to work well. 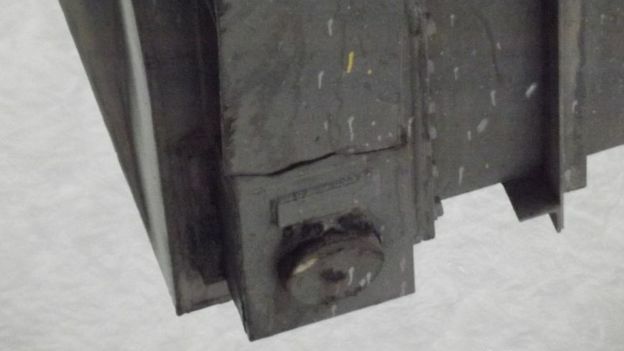 On Cleddau bridge, when the bearings began to fail,we looked at this alignment issue and found a whole string of issues which I will cover in more detail in the context of FRB. The main point, though, was that the bridge got hot on one side in the morning and the other side in the evening and so bent sideways in a way that was never seriously considered.The movement involved a plan twist of 0.5mm over the 440mm length of the roller. In other words the roller was being scrubbed round instead of simply rolling back and forth. Anyway, the point here is that the tolerances don't match and trouble ensues. The bridge deck is a steel truss about 7m deep and 25m wide. It is suspended from cables that sag about 75m in the 900m span so around 12:1 span to sag, a very deep structure in a world where beams might get to 30:1. The BBC web site has a nice drawing showing the critical area. The truss is supported very frequently from the cable but the end has to be anchored to the tower to allow a smooth transition from the suspended road to the tower. This bearing has to allow expansion and contraction of the better part of a metre whilepreventing up and down movement. It is done by using a long pendulum or drop link, pinned to the tower at the top and to the deck at the bottom. 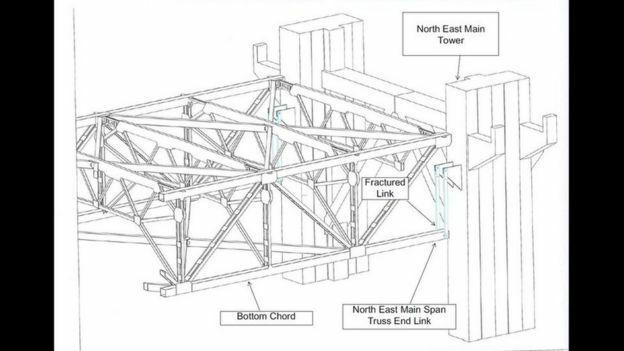 For symmetry, each side of the truss is supported from 2 links and these can be seen in the photo tweeted by @ForthRoadBridge. The men seen here are standing on the square bottom member of the truss and beside the end vertical. Both sides of the vertical is a drop link. Notice that the link tapers near the bottom. Before I get to the damage, I want to say a bit more about the bearings and what they have to do. In plan, the bridge looks very thin. When the wind blows,it moves sideways but the road still has to line up with the gap in the tower. How much does it move sideways? Well, a full carriageway of 7m in the middle. The bearing that prevents this movement at the tower is separate from the drop links and is in the middle of the bottom layer of the truss. The end of the truss rotates about this point, so when the wind blows, one drop link has to swing forward and the other back. Of course the truss wants the pins to rotate with it but the link wants them to stay parallel to the tower and there is one fight. I have made a very rough sketch of the bottom of the link here. \In this direction, the pin will tend to bend a little under load but so will the link. It is almost certain, though, that the load will not spread (as the designers hoped) uniformly over the contact area between the pin and the hole in the link. Now it is time to get to the photo of the damage. It seems to be in the public domain so I have copied it here. The point where I have marked the crack on my sketch has obviously suffered more stress, and particularly more stress cycling, than anyone expected. This has been going on for 50 years but will have got worse as a result of wear and corrosion. I suspect that is essentially a fatigue crack. It will have grown from a very small starter, possibly just a minor defect in a weld or even the edge of a perfectly good weld. The crack will have grown very slowly until it reached a critical length and the travelled through the rest at the speed of sound (which is very much faster in steel than in air). The critical length is rather shorter when the steel is cold so the rapid propagation may well have happened in the recent cold snap. Had the inspectors been looking for a crack they might well have spotted it sooner but there was a firm belief that the stresses were low. Only once the crack had become frighteningly big would it have been visible to an inspector. For a successful technology, engineering must take precedence over public relations, for nature cannot be fooled.